Crystal Illuminated House Marker - - the personalized LED illuminated and engraved address plaque with numbers that sparkle and shine. Plugs into a 110-volt wall socket. Wall mount 2 line sign with house number and street name (or house number only if you prefer). 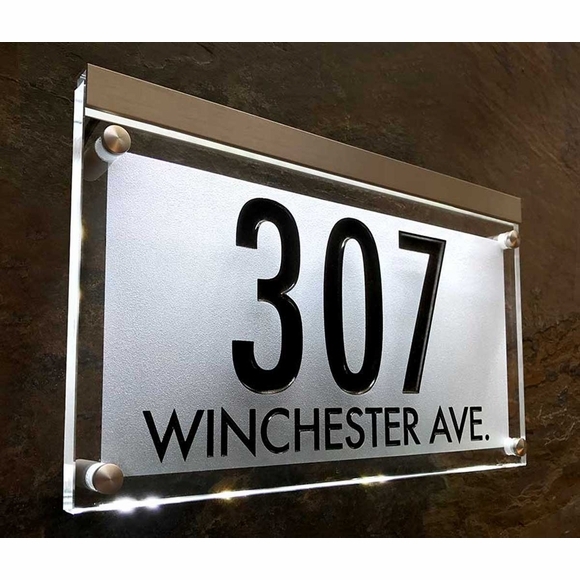 LED lighted engraved crystal address plaque features 3/8" crystal with finely polished edges. The address is engraved and painted on the front side of the crystal panel, and the back side of the crystal panel is frosted white. The LED light bar illuminates the sign from the top edge. When the sign is illuminated, the frosted white backer lights up, and the address is silhouetted in front. bronze hardware with bronze characters (small image with house number 1468). silver hardware with black characters (shown in large image above and small image on the far right). Hardware consists of mounting pins and a light bar. Mounting pins hold the plaque 1" from the wall. The house number line holds up to four (4) 3.75" numbers. If you want a one-line sign with just your house number, please leave the Street name input box empty. Address number shown above: 307 WINCHESTER AVE.